Summerwind 1203E is not your typical gulf front rental. 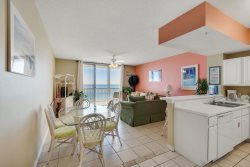 Granite countertops, amazing 12th floor views of the Longest Pier on the Beautiful Gulf of Mexico; this laid-back unit is perfect for a family vacation or a private get-away on beautiful Navarre Beach. As a guest of Summerwind 1203 E, you will have access to three pools, one of which is heated during the winter, as well as three hot tubs -- ALL GULF FRONT!! The Summerwind Resort also has multiple BBQ areas, as well as a seating area so that you and your family can enjoy barbecue on the beach! Summerwind 1203 E features a fully stocked kitchen, as well as a stackable washer and dryer, for your everyday needs. Experience "Ocean Devotion" at it's finest, rent 1203E today! This is our 2nd stay in this unit, and we would stay here again. 1203 is updated, comfortable and very clean. We love the beach, and love staying here! Property was clean and amazing!! We like Navarre properties because our expectations are met/exceeded each time we visit. Honestly, they went above and beyond. We had to switch our properties and they were amazing at handling that. Then they called us proactively on our drive down to touch base and let us know our condo was ready in advance. And when we had an issue with smokers smoking on all the surrounding balconies they were gracious enough to handle it. Friendliest staff ever! From the friendliest staff ever, to the gorgeous white beaches, and crystal clear water, and a very well maintained property what's not to love? We have loved our experience so much that we are looking into purchasing a condo here and are in love with Navarre! Only dealt with at check in. Very efficient!